This article is about the history of the area of the US state. For the history of northern Baja California, see Baja California § History. For the history of southern Baja California, see Baja California Sur § History. After the Portolá expedition of 1769–70, Spanish missionaries began setting up 21 California Missions on or near the coast of Alta (Upper) California, beginning with the Mission San Diego de Alcala near the location of the modern day city of San Diego, California. During the same period, Spanish military forces built several forts (presidios) and three small towns (pueblos). Two of the pueblos would eventually grow into the cities of Los Angeles and San Jose. After Mexican Independence was won in 1821, California fell under the jurisdiction of the First Mexican Empire. Fearing the influence of the Roman Catholic church over their newly independent nation, the Mexican government closed all of the missions and nationalized the church's property. They left behind a small "Californio" (white Hispanic) population of several thousand families, with a few small military garrisons. After the Mexican–American War of 1846-48, Mexico was forced to relinquish any claim to California to the United States. The unexpected discovery of gold at Sutter's Mill in 1848 produced a spectacular gold rush in Northern California, attracting hundreds of thousand of ambitious young men from around the world. Only a few struck it rich, and many returned home disappointed. Most appreciated the other economic opportunities in California, especially in agriculture, and brought their families to join them. California became the 31st US state in 1850 and played a small role in the American Civil War. Chinese immigrants increasingly came under attack from nativists; they were forced out of industry and agriculture and into Chinatowns in the larger cities. As gold petered out, California increasingly became a highly productive agricultural society. 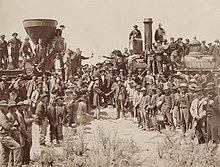 The coming of the railroads in 1869 linked its rich economy with the rest of the nation, and attracted a steady stream of migrants. In the late 19th century, Southern California, especially Los Angeles, started to grow rapidly. The native horticulturalists practiced various forms of forest gardening and fire-stick farming in the forests, grasslands, mixed woodlands, and wetlands, ensuring that desired food and medicine plants continued to be available. The natives controlled fire on a regional scale to create a low-intensity fire ecology which prevented larger, catastrophic fires and sustained a low-density agriculture in loose rotation; a sort of "wild" permaculture. The first European to explore the California coast was Juan Rodríguez Cabrillo (Portuguese: João Rodrigues Cabrilho), working for Spain. He died in southern California in 1543. Cabrillo and his men found that there was essentially nothing for the Spanish to easily exploit in California, and located at the extreme limits of exploration and trade from Spain it would be left essentially unexplored and unsettled for the next 234 years. The Cabrillo expedition depicted the Indians as living at a subsistence level, typically located in small rancherias of extended family groups of 100 to 150 people. They had no apparent agriculture as understood by Europeans, no domesticated animals except dogs, no pottery; their tools were made out of wood, leather, woven baskets and netting, stone, and antler. Some shelters were made of branches and mud; some dwellings were built by digging into the ground two to three feet and then building a brush shelter on top covered with animal skins, tules and/or mud. The Cabrillo expedition did not see the far north of California, where on the coast and somewhat inland traditional architecture consists of rectangular redwood or cedar plank semisubterranean houses. Traditional clothing was minimal in the summer, with tanned deerhide and other animal leathers and furs and coarse woven articles of grass clothing used in winter. Feathers were sewn into prayer pieces worn for ceremonies. Some tribes around Santa Barbara, California and the Channel Islands (California) were using large plank canoes to fish and trade, while tribes in the California delta and San Francisco Bay Area were using tule canoes and some tribes on the Northwest coast carved redwood dugout canoes. The staple foods then used by other American Indian tribes, corn and/or potatoes, would not grow without irrigation in the typically short three- to five-month wet season and nine- to seven-month dry seasons of California (see Mediterranean climate). Despite this, the natural abundance of California, and the environmental management techniques developed by California tribes over millennia, allowed for the highest population density in the Americas north of Mexico. Indians thrived on salmon and other fish, deer, tule elk, acorns, pine nuts, small game, mollusks, grass seed, berries, insects, edible plants, bulbs, and roots, making it possible to sustain a subsistence hunter-gatherer economy without agriculture as known by Europeans but by means of sophisticated management of landscapes and vegetation with regular, controlled low-intensity burning. This tradition of landscape management through fire ecology maintained acorn groves and other food sources, which along with knowledge of migratory herds such as elk and anadromous runs of salmon in the rivers, supported villages, small tribes, and extended family groups. A dietary staple for most Indian tribes in interior California was acorns, which were dried, shelled, ground to flour, soaked in water to leach out their tannin, and cooked. The grinding holes worn into large rocks over centuries of use are still visible in many rocks today. The ground and leached acorn flour was usually cooked into a nutritious mush, eaten daily with other traditional foods. Acorn preparation was a very labor-intensive process nearly always done by women. There are estimates that some Indians might have eaten as much as one ton of acorns in one year. Families tended productive oak and tanoak groves for generations. Acorns were gathered in large quantities, and could be stored for a reliable winter food source. Basket weaving was a high form of art and utility in California, as were canoe making and other carving. Local trade between Indian tribal groups enabled them to acquire seasonings such as salt, or foodstuffs and other goods that might be rare in certain locales, such as flint or obsidian for making spear and arrow points. Native cultures in California are much different from other Indian cultures in North America, and some have survived to the present day. California indigenous language diversity numbered 80 to 90 languages and dialects, some surviving to the present although endangered. The high and rugged Sierra Nevada mountains located behind the Great Basin Desert east of California, extensive forests and mountains in the north, the rugged and harsh Sonoran Desert and Mojave Desert in the south and the Pacific Ocean on the west effectively isolated California from easy trade or tribal interactions with Indians on the rest of the continent, and delayed the tragedies and damages of colonial-settler arrival until the Spanish missions, the Gold Rush, and the Euro-American invasion of indigenous Californians' territories. The Spanish divided California into two parts, Baja California and Alta California, as provinces of New Spain (Mexico). Baja or lower California consisted of the Baja Peninsula and terminated roughly at San Diego, California where Alta California started. The eastern and northern boundaries of Alta California were very indefinite, as the Spanish, despite a lack of physical presence and settlements, claimed essentially everything in what is now the western United States. The first permanent mission in Baja California, Misión de Nuestra Señora de Loreto Conchó, was founded on October 15, 1697, by Jesuit priest Juan Maria Salvatierra (1648–1717) accompanied by one small boat's crew and six soldiers. After the establishment of Missions in Alta California after 1769, the Spanish treated Baja California and Alta California as a single administrative unit, part of the Viceroyalty of New Spain, with Monterey, California, as its capital. After the conclusion of the Seven Years' War between Britain and France and their allies (called the French and Indian War in the British colonies on the East Coast) (1754–1763), France was driven out of North America. Spain and Britain were the only colonial powers left. Britain, as yet, had no Pacific colonies in North America. The Bourbon King Charles III of Spain established missions and other outposts in Alta California out of fear that the territory would be claimed by the British, who not only had 13 colonies on the East Coast, but also several islands in the Caribbean, and had recently taken over Canada from the French. The California Missions, after they were all established, were located about one day's horseback ride apart for easier communication and linked by the El Camino Real trail. These Missions were typically manned by two to three friars and three to ten soldiers. Virtually all the physical work was done by indigenous people convinced to or coerced into joining the missions. The padres provided instructions for making adobe bricks, building mission buildings, planting fields, digging irrigation ditches, growing new grains and vegetables, herding cattle and horses, singing, speaking Spanish, and understanding the Catholic faith—all that was thought to be necessary to bring the Indians to be able to support themselves and their new church. Mexico, after independence, was unstable with about 40 changes of government, in the 27 years prior to 1848—an average government duration was 7.9 months. In Alta California, Mexico inherited a large, sparsely settled, poor, backwater province paying little or no net tax revenue to the Mexican state. In addition, Alta California had a declining Mission system as the Mission Indian population in Alta California continued to rapidly decrease. By 1845, the province of Alta California had a non-native population of about 1,500 Spanish and Latin American-born adult men along with about 6,500 women and their native-born children (who became the Californios). These Spanish-speakers lived mostly in the southern half of the state from San Diego north to Santa Barbara. There were also around 1300 American immigrants and 500 European immigrants from a wide variety of backgrounds. Nearly all of these were adult males and a majority lived in central and northern California from Monterey north to Sonoma and east to the Sierra Nevada foothills. Hostilities between the U.S. and Mexico were sparked in part by territorial disputes between Mexico and the Republic of Texas, and later by the American annexation of Texas in 1845. Several battles between U.S. and Mexican troops led the United States Congress to issue a declaration of war against Mexico on May 13, 1846; the Mexican–American War had begun. Word of the conflict reached Alta California about a month later. Initially there was little resistance from anyone in California as they replaced the dysfunctional and ineffective Mexican government which had already been replaced by the Californios. The Mexican government by 1846 had already had 40 presidents in the first 24 years of its existence. Most new settlers and Californios were neutral or actively supported the revolt. An independent group of men called "Los Osos" raised the "Bear Flag" of the California Republic over Sonoma. The republic was in existence scarcely more than 25 days before Frémont returned and took over on June 23 from William B. Ide the leader of the Bear Flag Revolt. The California state flag of today is based on this original Bear Flag and still contains the words "California Republic. "John A. Sutter and his men and supplies at Sutter's Fort joined the revolt. In 1846, the U.S. Navy was under orders to take over all California ports in the event of war. There were about 400 to 500 U.S. Marines and U.S. Navy bluejacket sailors available for possible land action on the Pacific Squadron's ships. Hearing word of the Bear Flag Revolt in Sonoma, California, and the arrival of the large British 2,600-ton, 600-man man-of-war HMS Collingwood flagship under Sir George S. Seymour, outside Monterey Harbor, Commodore Sloat was finally stirred to action. 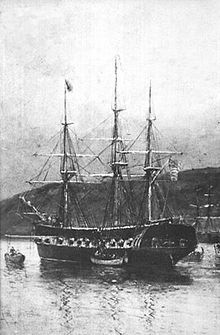 On July 7, 1846, seven weeks after war had been declared, Sloat instructed the captains of the ships USS Savannah and sloops Cyane and Levant of the Pacific Squadron in Monterey Bay to occupy Monterey, California—the Alta California capital. Fifty American marines and about 100 bluejacket sailors landed and captured the city without incident—the few Californio troops formerly there having already evacuated the city. They raised the flag of the United States without firing a shot. The only shots fired were a 21-gun salute to the new U.S. flag fired by each of the U.S. Navy ships in the harbor. The British ships observed but took no action. The abandoned Presidio and Mission San Francisco de Asís (Mission Dolores) at San Francisco, then called Yerba Buena, were occupied without firing a shot on July 9, 1846, by U.S. marines and U.S. Navy sailors from the sloop USS Portsmouth. Militia Captain Thomas Fallon led a small force of about 22 men from Santa Cruz, California, and captured the small town of Pueblo de San Jose without bloodshed on July 11, 1846. Fallon received an American flag from Commodore John D. Sloat and raised it over the pueblo on July 14. On July 15, 1846, Commodore (Rear Admiral) Sloat transferred his command of the Pacific Squadron to Commodore Robert F. Stockton when Stockton's ship, the frigate USS Congress, arrived from the Sandwich Islands (Hawaii). Stockton, a much more aggressive leader, asked Fremont to form a joint force of Fremont's soldiers, scouts, guides, and others, and a volunteer militia—many who were former Bear Flag Revolters. This unit, called the California Battalion, was mustered into U.S. service and were paid regular army wages. On July 19, Frémont's newly formed "California Battalion" swelled to about 160 men. These men included Fremont's 30 topographical men and their 30 scouts and hunters, U.S. Marine Lieutenant Archibald H. Gillespie, a U.S. Navy officer to handle their two cannons, a company of Indians trained by Sutter and many other permanent California settlers from several different countries as well as American settlers. The California Battalion members were used mainly to garrison and keep order in the rapidly surrendering California towns. The California Constitution was ratified by popular vote at an election held on a rainy November 13, 1849 (as specified in Article XII Sec. 8). The Pueblo de San Jose was chosen as the first state capitol (Article XI Sec. 1). Soon after the election they set up a provisional state government that set up the counties, elected a governor, senators, and representatives, and operated for ten months setting up a state government before California was given official statehood by Congress on September 9, 1850, as part of the Compromise of 1850. San Francisco shipping boomed, and wharves and piers had to be developed to handle the onslaught of cargo--Long Wharf was probably the most prominent. To meet the demands of the Gold Rush, ships bearing food, liquors of many types, tools, hardware, clothing, complete houses, lumber, building materials, etc. as well as farmers, entrepreneurs, prospective miners, gamblers, entertainers and prostitutes, etc. from around the world came to San Francisco. These imports included large numbers of Galapagos tortoise and sea turtle imported into Alta California to feed the Gold miners. Initially, the large supplies of food needed were imported from close ports in Hawaii, Mexico, Chile, Peru, and the future state of Oregon. The Californios initially prospered, as there was a sudden increase in the demand for livestock. These food shipments changed mainly to shipments from Oregon and internal shipments in California as agriculture was developed in both states. The state was formerly under the military governor Colonel Richard Barnes Mason who only had about 600 troops to govern California—many of these troops deserted to go to the gold fields. Before the Gold Rush, almost no infrastructure existed in California except a few small Pueblos (towns), secularized and abandoned Missions and about 500 large (averaging over 18,000 acres (73 km2)) ranchos owned by the Californios who had mostly taken over the Missions land and livestock. The largest town in California prior to the Gold Rush was the Pueblo de Los Angeles with about 3,500 residents. The sudden massive influx into a remote area overwhelmed the state infrastructure, which in most places didn't even exist. Miners lived in tents, wood shanties, wagons, or deck cabins removed from abandoned ships. Wherever gold was discovered, hundreds of miners would collaborate to establish what a mining claim could be, put up a camp and stake their claims. With names like Rough and Ready and Hangtown (Placerville, California), each camp often had its own saloon, dance hall, and gambling house. Prices were inflated in the camps. Miners often paid for food, liquor and other goods in "dust." Most California Indians are thought to have been located near the coast, the same areas the Spanish Missions were established. Since California Indians had no agriculture before it was introduced by the Franciscan padres, they were strictly hunter-gather society tribes which could not support large populations—large populations require agriculture. During the Spanish and Mexican California occupation period nearly all coastal tribes south of San Francisco were induced to join a mission. So many Mission Indians died from exposure to harsh conditions at the missions and diseases like measles, diphtheria, smallpox, syphilis, etc. that at times raids were undertaken to new villages in the interior to supplement the supply of Indian women at the missions. As reported by Krell, as of December 31, 1832, the mission Franciscan padres from 1800 to 1830 had performed a combined total of 87,787 baptisms and 24,529 marriages, and recorded 63,789 deaths. If Krell's numbers are to be believed (others have slightly different numbers) the Mission Indian population had declined from a peak of about 87,000 in about 1800 to about 14,000 in 1832 and continued to decline. The Missions were becoming ever more strained as the number of Indian converts drastically declined and the deaths greatly exceeded the births. The ratio of Indian births to deaths is believed to have been less than 0.5 Indian births per death. After the missions were disbanded in 1832 the surviving Indians mostly went to work on the about 500 newly established ranchos who appropriated the mission's "property" (about 1,000,000 acres (400,000 ha) acres/mission). The Indians typically worked at one of the four Spanish pueblos as servants or at the newly established ranchos for room and board or attempted to join other tribes in the interior. The new ranchos occupied nearly all their original tribal territories. The Butterfield Overland Mail Stage Line  was a stagecoach service operating from 1857 to 1861 of over 2,800 miles (4,500 km). 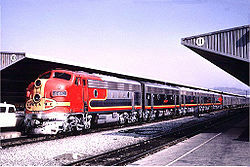 It carried passengers and U.S. Mail from Memphis, Tennessee and St. Louis, Missouri to San Francisco, California. The Butterfield Overland Stage Company had more than 800 people in its employ, had 139 relay stations, 1800 head of stock and 250 Concord stagecoaches in service at one time. 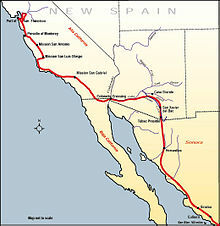 The routes from each eastern terminus met at Fort Smith, Arkansas, and then continued through Indian Territory (Oklahoma), Texas, and the future states of New Mexico, Arizona along the Gila River trail, across the Colorado River at the Yuma Crossing, and into California ending in San Francisco. Once cargo was moved off the ocean and rivers it nearly always transported by horse or ox drawn wagons—still true till about 1920. When there was not a wagon trail the cargo was shifted to mule pack trains or carried on the backs of the miners. Lumber to build new homes, sluice boxes, etc. was a crying need and food to feed the miners was needed even more. However, California has a lot of native timber and even as early as 1850 there were saw mills set up to turn some of this timber into lumber. Food was initially imported from any and all west coast ports from Hawaii, Oregon or Mexico where it could be obtained. The lumber and food were transported by ships that had initially carried gold rush passengers and in many cases abandoned in the bay and could usually be bought cheap. The many goods the gold miners needed for a "modest" 1850s lifestyle were nearly always hauled by horse, mule or ox drawn wagons. Wheat and timber were early products from Oregon and the Columbia River area that could be economically imported. Soon it was found that some types of spring wheat could be planted in the fall in California and the mild winter with its rains would allow good crops to be harvested in the spring without irrigation. Later. much of this wheat was exported to ports around the world, California finally had a return cargo for its many incoming ships. California in the 1890s became the foremost wheat producer in the U.S. but could not really compete on the east coast with the burgeoning wheat lands being brought into production in the midwest were much closer to their markets. Other crops in California were usually found to be much more profitable and California joined the rest of the nation in importing most of its wheat from farms in the midwest. The year 1848 saw the close of Mexican control over Alta California, this period also marked the beginning of the rancheros' greatest prosperity. The Californio rancho society before 1848 had few resources except large herds of Longhorn cattle which grew almost wild in California. The Ranchos produced the largest cowhide (called California Greenbacks) and tallow business in North America by killing and skinning their cattle and cutting off their fat. The cowhides were staked out to dry and the tallow was put in large cowhide bags. The rest of the animal was left to rot or feed the California grizzly bears then common in California. The traders who traded for the hides, tallow and sometimes horns hauled them back to the east coast where the hides were used to make a large variety of leather products, most of the tallow was used for making candles and the horns were mostly used for making buttons. A trading trip typically took over two years. The classic book Two Years Before the Mast (originally published 1840) by Richard Henry Dana, Jr. gives a good first-hand account of a two-year sailing ship sea trading voyage to California which he took in 1834-5. Dana mentions that they also took back a large shipment of California longhorn horns. Horns were used to make a large number of items in this time period. (The eBook of Two Years Before the Mast is available at Gutenberg project.) A large part of the Californio diet was beef, but since there was no easy way to preserve it most of the time another animal was killed when fresh meat was needed as when visitors showed up—the hides and tallow could be salvaged and very little was lost. The market for beef dramatically changed with the onset of the Gold Rush, as thousands of miners, businessmen and other fortune seekers flooded into northern California. These newcomers needed meat, and cattle prices soared from the $1.00 to $2.00 per hide to $30.00-$50.00 per cow. From about 1848 to about 1860 the rancheros enjoyed the "golden" days of Hispanic California. The largely illiterate ranchero owners lost nearly all their land to a few bad years for cattle in the 1860s and the many mortgages they had taken out to finance a "prosperous" life style and could no longer pay back. In the early years of the Gold Rush the demand for beef was so great that there are records of about 60,000 longhorns being herded from Texas to California. After the 1870s, stagecoaches provided the primary form of local passenger and mail transportation between inland towns that were not connected to a railroad, with sailing ships and paddle wheel steamships connecting port cities. Freight wagons still hauled nearly all cargo. Even when railroads arrived, stages were essential to link more remote areas to the railheads. Top of the line in quality, with crowded discomfort, was the nine-passenger Concord stagecoach, but the cheaper, rougher "mud wagons" were also in general use. The Wells Fargo company contracted with independent lines to deliver its express packages and transport gold bullion and coins. Stagecoach travel was usually uncomfortable as passengers were often crowded together in limited space, dust pouring through open windows from rough unpaved roads, rough rides, un-bathed fellow passengers and poorly sprung steel tired stagecoaches. Some drivers were famous for their skill in driving six horses down winding roads at top speed, only rarely overturning. Rate competition from competing stage lines reduced fares to as little a two cents per mile on some routes—a $1.00/day was then a common wage. Bandits found robbing coaches a profitable if risky venture as they may be shot or hanged if caught. U.S. government mail subsidies provided essential base income for many stage lines, but running a stage line was often a financially unstable business enterprise. By the 1890s the construction of electric railroads had begun in California and by the early 20th century several systems existed to serve California's largest cities. 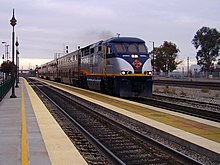 The state's electric railroad systems included the San Diego Electric Railway, Los Angeles' Pacific Electric system, the Los Angeles Pacific Railroad, East Bay Electric Lines and the San Francisco, Oakland, and San Jose Railway and Interurban rail systems such as the Sacramento Northern Railway were also constructed. By the 1920s, Los Angeles' Pacific Electric system was the largest electric railroad in the world. ^ "California Indian History". 26 October 2008. Archived from the original on 26 October 2008. Retrieved 7 November 2017. ^ Blackburn, Thomas C. and Kat Anderson, ed. (1993). Before the Wilderness: Environmental Management by Native Californians. Menlo Park, California: Ballena Press. ISBN 978-0879191269. ^ Cunningham, Laura (2010). State of Change: Forgotten Landscapes of California. Berkeley, California: Heyday. pp. 135, 173–202. ISBN 978-1597141369. ^ a b c "California Indian Cultures". Four Directions Institute. Retrieved January 6, 2014. ^ "Acorn consumption". Archives.gov. Archived from the original on 2014-02-22. Retrieved 7 November 2017. ^ "Acorn preparation". Archives.gov. Archived from the original on 2014-02-22. Retrieved 7 November 2017. ^ "Survey of California and Other Indian Languages". Archived from the original on 23 May 2016. Retrieved 25 February 2018. ^ Starr, Kevin. California: A History. New York: Modern Library (2005), Chapter 2. ^ "Visitors: San Francisco Historical Information". City and County of San Francisco. n.d. Archived from the original on 2008-03-31. Retrieved 2008-06-10. ^ "The Founding of Monterey". Monterey County Historical Society. Retrieved 12 November 2012. 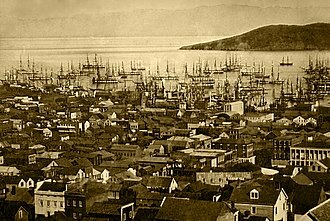 ^ a b c d e "San Francisco History - Seventy-five Years in San Francisco, Appendix N. Record of Ships Arriving at California Ports from 1774 to 1847". Sfgenealogy.com. Retrieved 7 November 2017. ^ Dana, Richard Henry (1842). Two Years Before the Mast: A Personal Narrative of Life at Sea. New York: Harper & Brothers. pp. 93, 97, 209–210. ^ (For the Revillagigedo Census of 1790 listing the inhabitants of Monterey and the other presidios and pueblos, see The Census of 1790, California, California Spanish Genealogy. Retrieved on 2008-08-04. Compiled from William Marvin Mason. The Census of 1790: A Demographic History of California. (Menlo Park: Ballena Press, 1998). 75-105. ISBN 978-0-87919-137-5. ^ a b "US Government Revenue, Deficit and Debt - Numbers Charts Analysis History". usgovernmentrevenue.com. Retrieved 7 November 2017. ^ "John Sutter, Sutters Fort". ^ California, California State Parks, State of. "Sutters Fort SHP". CA State Parks. Retrieved 7 November 2017. ^ a b "History of California including the Indians, Spanish, Californio, Bear Flag Republic, United States, and their flags". Calrepublic.tripod.com. Retrieved 7 November 2017. ^ "Home". Cambridge University Press. Archived from the original on 2012-10-21. Retrieved 7 November 2017. ^ "Statistical Abstracts". 29 December 2004. Archived from the original on 29 December 2004. Retrieved 7 November 2017. ^ Sanchez, Loretta (1999). Congressional Record. Washington DC: Congress. p. 26010. ^ "1849. Ship and Passenger Arrivals, San Francisco, California, The Maritime Heritage Project. Sea Captains, Ships, Merchants, Merchandise, Immigration and Passengers". Maritimeheritage.org. Retrieved 7 November 2017. ^ Conrad, Cyler; Pastron, Allen (2014). "Galapagos Tortoises and Sea Turtles in Gold Rush-Era California". California History. 91 (2): 20–39. ^ Conrad, Cyler; Gobalet, Kenneth W.; Bruner, Kale; Pastron, Allen G. (2015). "Hide, Tallow and Terrapin: Gold Rush-Era Zooarchaeology at Thompson's Cove (CA-SFR-186H), San Francisco, California". International Journal of Historical Archaeology. 19 (3): 502–551. doi:10.1007/s10761-015-0297-2. ^ "Early History of the San Francisco Fire Department". Sfmuseum.org. Retrieved 7 November 2017. ^ "A Golden Dream? A Look at Mining Communities in the 1849 Gold Rush". Sell-oldgold.com, an educational resource for historical gold, silver, and coin information. Archived from the original (PDF) on 2012-02-21. Retrieved 2009-07-27. ^ "Page moved. Automatic redirect". Maritimeheritage.org. Retrieved 7 November 2017. ^ "California's state-sanctioned genocide of Native Americans". Newsweek.com. 17 August 2016. Retrieved 7 November 2017. ^ The Troy weight system is traditionally used to measure precious metals, not the more familiar avoirdupois weight system. The term "ounces" of gold typically refers to troy ounces. There are some historical uses where, because of the age of the use, the intention is ambiguous. ^ Charles N. Alpers; Michael P. Hunerlach; Jason T. May; Roger L. Hothem. "Mercury Contamination from Historical Gold Mining in California". U.S. Geological Survey. Retrieved 2008-02-26. ^ "Destruction of the California Indians". California Secretary of State. Archived from the original on 2011-12-07. Retrieved 2012-04-15. ^ "California Militia and Expeditions Against the Indians, 1850 - 1859". Militarymuseum.org. Retrieved 7 November 2017. ^ a b c d "INDIANS of CALIFORNIA - American Period". Cabrillo.edu. Retrieved 7 November 2017. ^ Robert H. Ruby and John Arthur Brown, Indian slavery in the Pacific Northwest (1993), ch 7, "The Northwest California Slave"
^ "SAN FRANCISCO / Slavery in Gold Rush days / New discoveries prompt exhibition, re-examination of state's involvement". Sfgate.com. 2007-01-27. Retrieved 7 November 2017. ^ Michael Casey. "California Longhorns Vs. Texas Longhorns of Yesteryear and Today - A Comparative Study". Fairlea Longhorns. Retrieved December 11, 2014. ^ Fessenden Nott Otis, Isthmus of Panama: History of the Panama railroad; and of the Pacific Mail Steamship Company, Harper & Brothers, New York, 1867 pp. 21-36. ^ "The Maritime Heritage Project Passenger Lists". ^ Coate, Bill (March 16, 2003). "Last blast from steamers on the San Joaquin". Madera Tribune. Archived from the original on September 27, 2011. ^ "John Butterfield Father of the Butterfield Overland Mail". DesertUSA. Retrieved 6 February 2011. ^ Two Years Before the Mast by Richard Henry Dana. Gutenberg.org. July 2003. Retrieved 7 November 2017. ^ "Monterey County Historical Society, Local History Pages--The California Cattle Boom, 1849-1862". Mchsmuseum.com. Retrieved 7 November 2017. ^ "Pony Express Trail map" (PDF). Fs.fed.us. Retrieved 28 January 2009. ^ Nathan Masters (January 17, 2013). "Lost Train Depots of Los Angeles". Socal Focus. KCET. Retrieved 1 July 2014. ^ "SCVHistory.com - Newhall-Downtown - 1876: Southern Pacific Tunnels Through". Scvhistory.com. Retrieved 7 November 2017. ^ Walter Nugent (2001). Into the West: The Story of Its People. Random House Digital, Inc. p. 5. ISBN 9780307426420. Aron, Stephen. "Convergence, California and the Newest Western History", California History Volume: 86#4 September 2009. pp 4+ historiography. Hayes, Derek. Historical Atlas of California: With Original Maps, (2007), 256 pp. Hoover, Mildred B., Rensch, Hero E. and Rensch, Ethel G. Historic Spots in California, Stanford University Press, Stanford, CA. (3rd Ed. 1966) 642 pp. Hutchinson, Alan. Frontier Settlements in Mexican California: The Hijar Padres Colony and Its Origins, 1769-1835. New Haven: Yale University Press 1969. Timeline of California — "California: Guide to the Golden State;" Federal Writers' Project; 1939. An Act for the Admission of the State of California into the Union — 31st Cong., Sess. I, Ch. 50, September 9, 1850. This page was last edited on 21 March 2019, at 23:00 (UTC).